Scotland’s biggest selling West Coast weekly has brought out a new edition for one of the towns on its patch. 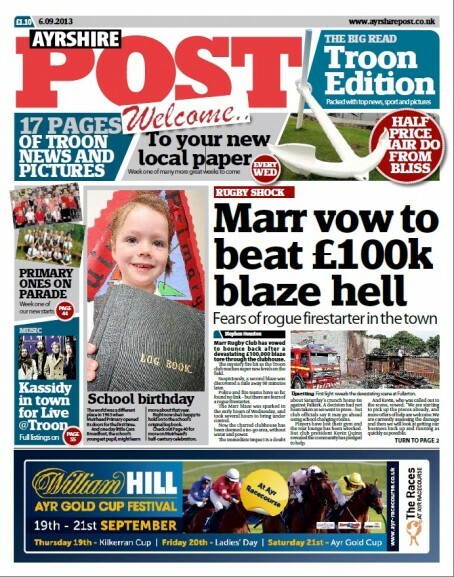 The Troon edition of The Ayrshire Post hit the streets this week and owner Trinity Mirror says the development represents a major investment in the paper. The Post, part of Trinity’s Media Scotland division, often runs to 128 pages of which up to 17 will now be dedicated to news and features covering Troon. The new edition is the brainchild of Ayrshire Post editor, Cheryl McEvoy and follows the launch, 21 years ago, of an edition for the Carrick geographical area covered by the title. Said Cheryl: “I am proud to have realised our ambition to expand at a time when the industry has never been under such pressure. Helena Morrow, commercial manager for Media Scotland regionals, said the bold move had been a success so far. “The Troon edition will also help advertisers get their message across in a newspaper product that is second to none,” she said. The paper celebrated with an official launch party at Troon Concert Hall. Troon is due to host The Open golf championship in 2016. Oops – what a mess the front page looks! Great to hear a new publication launching but I agree with Observer50 – that front page is disgusting. It is so busy it makes me not want to read it and the anchor has overrun the H.